Before you start a script, it might be needed to ask the user for some settings before you can start the script. In this example we are simply going to bury bones and ask the user which bones he wants to bury. 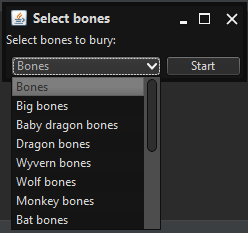 I am not going to show how to bury bones in this example, but only how you can get the information from the user. Hopefully this helps some people out to create their first little gui, if you have suggestions or want to add something to the script, please let me know in the comments! Needed a hand with this thank you! @Spencer Thanks, I will update this probably tomorrow. I have added a simple and advanced part, thanks @Spencer for the single input dialog! @Transported Can you please recreate the error and post the details here? Normally you shouldn't call the run function like that. It's a runtime error btw. Okay I didn't know about this, thanks for the solution!